The black smoke westbound Interstate-10 motorists are seeing as they approach Cabazon is what appears to be an electrical fire in a wind turbine engine. The fire is isolated to the gear box. 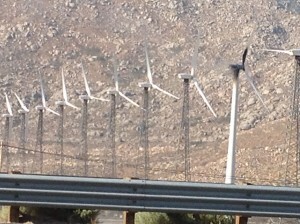 The turbine is on the south side of the freeway. One highway patrol car is on standby until crews arrive.